The Lizard Man is a Collectable Minifigure released in 2011 as one of the sixteen minifigures from 8805 Minifigures Series 5. He also appears with Gorilla Suit Guy in the LEGO Marvel Super Heroes TV Short. 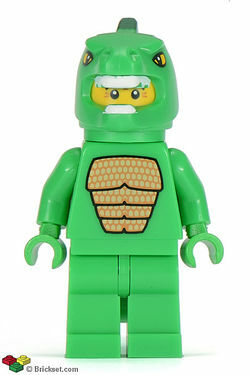 Similar to the Gorilla Suit Guy from Series 3, he comes with a new green dinosaur mask, with its mouth open to allow the minifigure to see, and a tail piece that clips around his neck. The torso of the minifigure is green with a buff, tan printed chest resembling scaled plating. The legs are also green. His description mentions him wanting to fight Gorilla Suit Guy, hinting at a Godzilla vs. King Kong relationship. Although the computer-generated images on LEGO.com show part of his mouth, on the physical minifigure, his mask covers his entire mouth. He appears with the Gorilla Suit Guy in the LEGO Marvel Super Heroes Disney XD Short. He makes a cameo appearance in The LEGO Movie as a Master Builder. This is a description taken from LEGO.com. Please do not modify it. (visit this item's product page) The Lizard Man lives to trample cities beneath his big green feet. Of course, since he’s really just a minifigure of normal size wearing a lizard suit, that’s not as easy as it sounds…so instead, he spends hours building his own meticulously detailed miniature buildings and then stomping all over them while making roaring noises. The Lizard Man lives to trample cities beneath his big green feet. Of course, since he’s really just a minifigure of normal size wearing a lizard suit, that’s not as easy as it sounds…so instead, he spends hours building his own meticulously detailed miniature buildings and then stomping all over them while making roaring noises. When your greatest dream is to be a giant monster, it’s tough to find new hobbies. The Lizard Man sometimes thinks about becoming a professional wrestler, but the Gorilla Suit Guy never writes back to any of his challenges. On the other hand, rumor has it that the Super Wrestler would be happy to take him up on the offer anytime! This page was last edited on 11 July 2016, at 23:43.